In my previous green tea confection post, Wandering Chopsticks suggested I make green tea truffles as a way to use up my aging matcha. 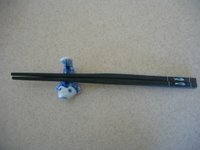 It was a brilliant idea and what better time to make them since June is National Candy Month. The truffle center is a white chocolate ganache flavored with green tea. White chocolate is a powerful flavor so it is the first thing that you taste but as the truffle melts in your mouth the floral flavors of the green tea slowly emerges. 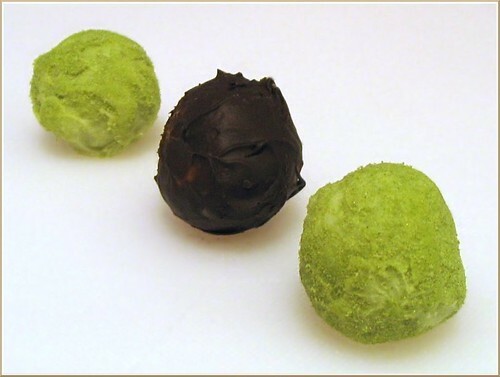 The truffle is then coated with a shell of white, dark, or green chocolate (white chocolate with more matcha mixed in). Finally it can be rolled in some matcha powder or cocoa powder, or drizzled with a different colored chocolate. 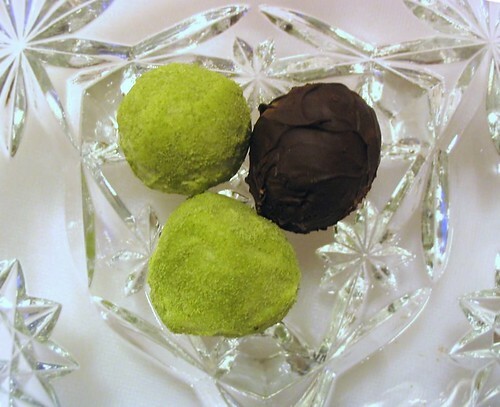 The truffles covered in dark chocolate are especially fun because people will be surprised to see a green center when they bite into the chocolate and find out it is green tea and not mint. - This was an experiment so the quantities are quite small but it can be doubled. The original recipe makes a dozen truffles. - In the recipe I specified to use 1 teaspoon of matcha but taste the mixture before chilling it to see if you wish to add more. - If you choose to coat the center in green chocolate and roll it in matcha you might want to use a little less matcha in the filling. 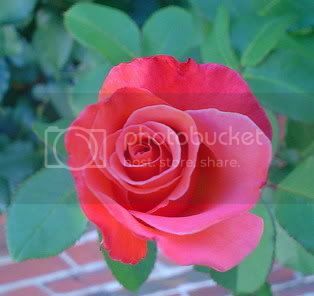 - The truffles are best served a little chilled, at room temp the centers are a bit too soft. For the filling, add the roughly chopped chocolate, whipping cream, and matcha in a heat proof bowl and melt over a double boiler or in the microwave heating in short bursts. Taste the filling first to see if it needs more matcha, then chill it for a few hours in the fridge before using. Using a melon baller or teaspoon, scoop mounded spoonfuls of the ganache mixture onto a parchment lined baking sheet. You can also wear some gloves and use your hands to roll the drops into uniform balls. You should end up with around 11 – 12. Chill the ganache balls again for a few hours in the fridge or 30 minutes in the freezer. Melt the chocolate for the outer shell. There are two ways to coat the truffles, you can either use a toothpick and dip each ball into the melted chocolate, or you can wear a pair of gloves, add some melted chocolate to the palm of a gloved hand, and roll each ball in your palm. Set each coated truffle onto the same parchment lined baking sheet. Let the chocolate harden a little then you can roll it in cocoa powder or matcha powder (and dust off the excess). Interested in more in-depth truffle making guides? I wish I found this sooner! Helen makes gorgeous truffles! Yum! I take full credit! hahaha! Hahaha...you indeed put the green tea truffles idea into good execution. Well done. :) Can I have some ? What a great idea! I've got some matcha sitting around in my pantry that's not as fresh as it might be -- I'm going to hide it in these chocolate truffles! You deserve all the credit since you came up with this idea! Amy, you are a wonderful candy maker, sweetie! Your truffles are just beautiful. I've worked with chocolate a lot and tempering can be a real pain in the neck. hey, those looks beautiful and delicious. I was just thinking of making this today as soon as I can find one shop here that sells green tea powder. You are too kind! Your walnut camafeus were far more stunning. Tempering did seem like more trouble than it was worth. I hope you can find the green tea powder! I'll have to find a local place to purchase some too as soon as I use up my current stash. Thanks for sharing that site, it looks like a great place to buy teas. Those are just GORGEOUS! Thanks for sharing! Wow...I wish you could send me a box right now! These look delicious! I agree these look amazing. How high of a grade of matcha do you think is needed for confections like this?